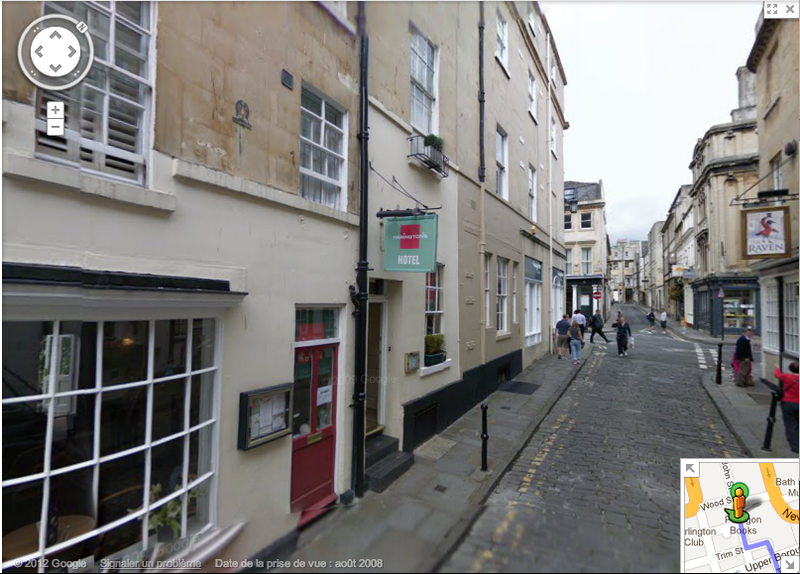 I've stayed a good many places in Bath, England as I have the tendency not to plan my trips ahead of time. I often book the rooms the same day because I haven't made up my mind if I want to go visit another part of the country or stay in place. As a result, I usually end up paying more than the rooms should cost, but not hugely (I've usually gotten rooms for £70-140/night in doing this). I also find that I end up being unable to book more than 2-3 nights in one place, which means during a week I have managed to stay in as many as 3-4 different hotels and guest homes. Thanks to this experience, I feel I can somewhat authoritatively discuss the pros and cons of different establishments. Over the next few years I will attempt to review all of the places I have stayed, in order for you to get a better picture of what is available in the city. Entrance to Harrington's Hotel, as seen on Google's street-view. 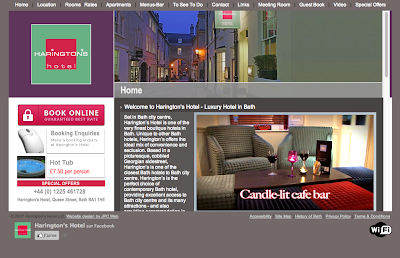 Harrington's Hotel is a really cute place which stands out because of its good service, chic decor, and good location. Depending on the price in a given week, I would say that you will be getting a very well rewarded experience from the very friendly concierge, included amenities, and walkable nature of its location in central Bath. On average, however, I expect this place to run more expensive than some less-featured establishments, but they do run sales and promotions through the VisitBath website, which is how I booked it for two nights. Sitting at a small table in the bar area enjoying some quiet in the afternoon. The hotel also offers wifi, which as you can see is extremely convenient! The bar area has a very elegant, modern, and cozy feel to it. I have not sampled the drinks, but the convenience of an on-premise bar is something that not all places share in Bath. 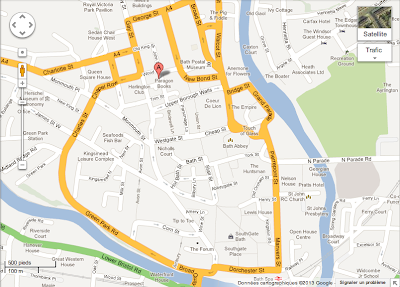 Should you wish to go out, there are plenty of walkable options nearby! View from the bar looking into a lounge room that opens into the reception and concierge area. Breakfast is served in the dining room which has vibrantly colored walls and modern leather seating. My recollection is that the food was quite enjoyable and the menu had most of the traditional breakfast items on it, British and otherwise. If you sit in the front room, you will find yourself looking at a cute vintage shop across the street (As of September 2011). Unfortunately, I did not have time to visit Scarlet Vintage during their store hours, but the display was certainly quite enticing! I believe my original room was upgraded when I arrived, because the room I received was much larger than I had expected. However, I anticipate that all the rooms are of similar elegance and refinement. Bed with seat in front of it. Highly convenient setup. More accessories, including chairs, dresser, and vanity. Bathroom includes a heated towel rack radiator. Also included, bathtub with separate shower head on detachable hose. In conclusions, I have no real complaints as I do not happen to be a demanding hotel guest and the hotel more than satisfied my needs when I was in residence. Neither the price nor the experience is exactly cheap, but I feel you will not be disappointed. I really loved the hotel view having all the arrangements.Modifying your bathroom into a spa by furnishing it with the stylish showers, bright lighting, curtains, underfoot cloth, walk in bath, walk in showers system etc. All these accessories can change the look over of bathroom into a spa. I am fond of such updated designs. The home spa experience can be taken in the bathroom with whirlpool baths and saunas/steam showers as the must have features of a dream bathroom.Even the bathroom can be modified with updated designs so people would be interested to walk in baths.